Fifty-two years ago today, Don was one of two men who climbed into the 150-ton bathyscaphe Trieste, closed the hatch, dropped through 7 miles (11 kilometers) of water to the seafloor, and returned to the surface. 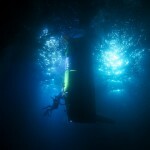 His record-breaking dive was to the Mariana Trench, the deepest spot on the planet. The former U.S. Navy commander and pilot of the Trieste is here in Sydney for a week, and he’ll be on board with us when our team sets out toward the trench. Don, the former dean of marine programs and professor of ocean engineering at the University of Southern California, is a longtime friend of Jim’s. 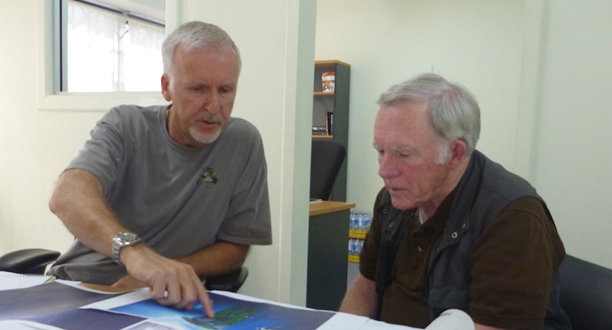 For the past ten years, Jim has been briefing him on the DEEPSEA CHALLENGER project. 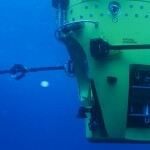 They’ve spent days discussing the physics, geology, and biology of the deep ocean and the highly complex systems needed to make a successful seven-mile (11-kilometer) dive. Today, Jim and Don, who’s affectionately called an “ocean encyclopedia,” poured over the charts of the western Pacific and walked around the new sub, examining every component, including the one-person crew sphere, lithium-ion batteries, its mechanical arm, 3-D cameras, and an array of LED lights on the sub’s forward surface.